Returning for its fifth year, the Ontario Festival of Small Halls gives fans of roots, pop, folk, blues, soul and country a chance to see artists in a variety of intimate area venues. Now, organizers have lifted the curtain on this year's lineup. Names set to perform at this year's festival include Kathleen Edwards, Colter Wall, Basia Bulat, Skydiggers, Lindi Ortega, William Prince, Barney Bentall, Jim Bryson, Stephen Fearing, Jeremy Fisher and more. Further artists are set to be announced in the coming weeks. "This year's lineup celebrates some of Canada's most cherished singer-songwriters and storytellers, many of whom live right here in our region," festival general manager Kelly Symes said in a statement. 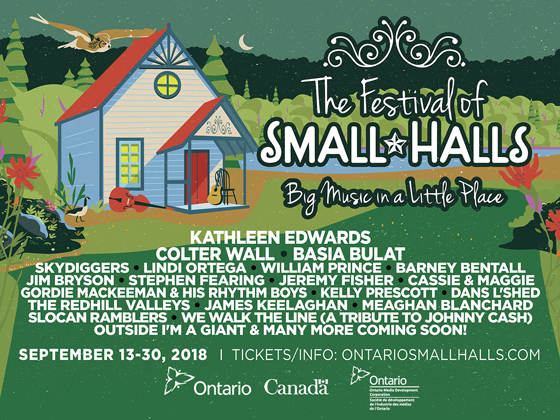 The 2018 edition of the Ontario Festival of Small Halls runs from September 13 to 30 in a variety of venues and community spaces across Eastern Ontario and the Ottawa Valley. Tickets go on sale June 20 at 10 a.m. EDT. Tickets can also be purchased by phone starting June 27 at 613-402-1425. Further ticketing information and a current festival schedule can be found through the festival's official website.